Recent graduates of the University of Michigan’s Program in the Environment (PitE), Nate Lada (08’) and Jill Sweetman (‘10) have recently made two major commitments– first, to each other (engaged in December! ), and second, to the development of a new business and farm, which promises to provide fresh produce year-round to the Ann Arbor community. 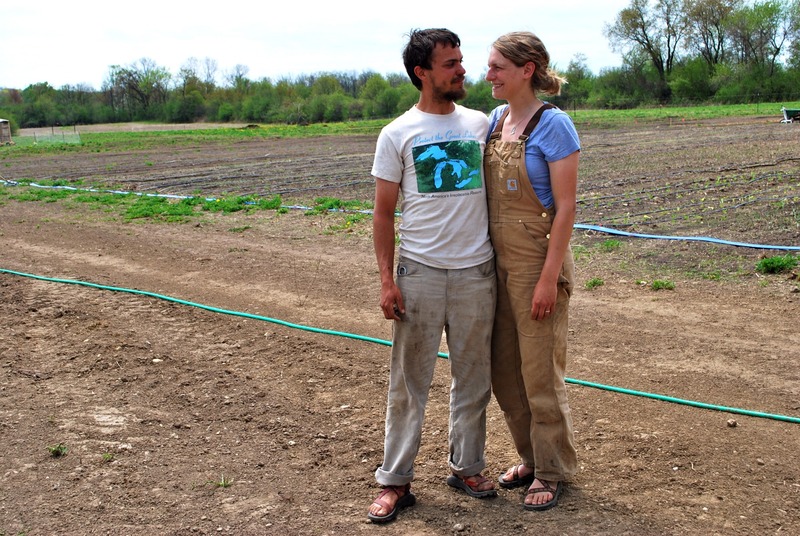 Nate and Jill started Green Things Farm this year through a partnership with the Tilian Farm Development Center, which aims to increase the amount of food produced and consumed in Washtenaw county. Jeff McCabe of Selma Cafe, well aware of both the extraordinary need for farmers in the area and the difficulty for new farmers in getting started, wrote a grant request to the USDA to fund the Tilian Farm Development Center’s efforts at increasing local sustainable food production in Washtenaw County. Tilian’s Four Season Farmer Development Program provides new farmers with the necessary funds, land, and guidance in starting their farming businesses for the duration of two years, at which point they will be better equipped to move on to their own land and continue their farming businesses. The project currently includes three farms: Green Things Farm, Seeley Farms, and Bending Sickle Community Farm. 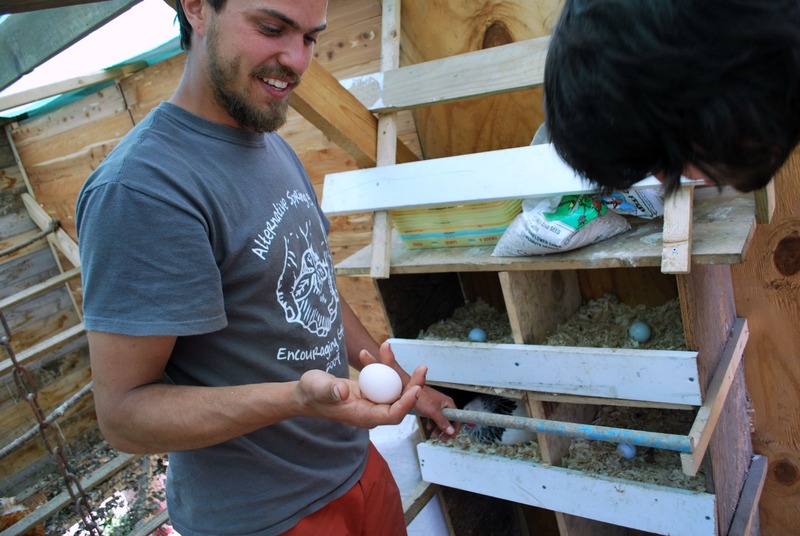 Nate, who specialized in ethno-ecology in PitE, got his first real experience in agribusiness when he started a business selling the produce from his grandparents land in 2007. Last year, he started the community garden at the University of Michigan’s Biological Station (which produced enough food for a 200 person salad bar twice a week), composted waste from the dining hall, and provided space for an ethnobotany class to do perennial cultivation and for an ecology class to run experiments. Jill grew up in Grand Rapids riding horses and working on farms, and in her adult life has WWOOFed on several farms. She studied restoration ecology and works on the restoration of natural areas for the city as a side job, but is otherwise new to agricultural business. “We’re self starters,” says Jill. “We don’t have much formal training. Every day is a learning experience.” Nate and Jill are following the CSA model this year and are very thankful for the small board of supportive, experienced mentors provided by Tilian who are able to guide them through any issues that might arise along the way. 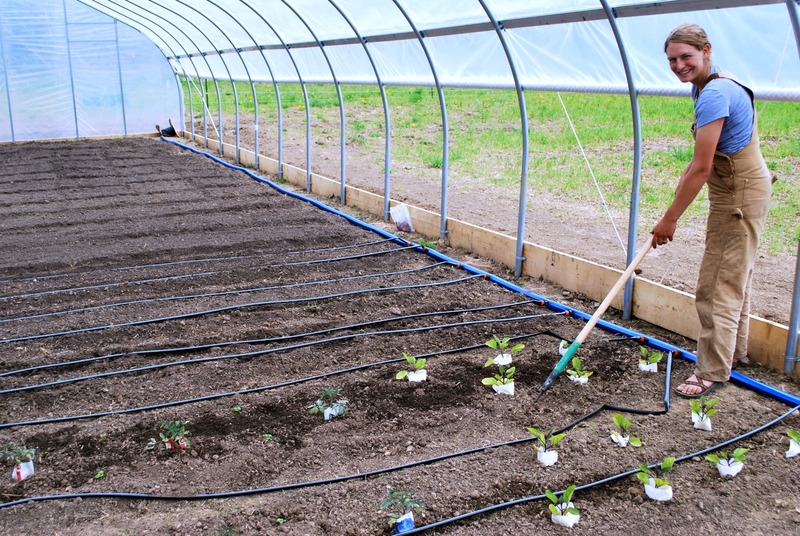 Together they spend about thirteen hours a day working on the land and in the hoop house. “It’s a lifestyle more than a job,” Jill humbly asserts. They seem to love everything about the farming lifestyle, including working outside, their twenty-eight chickens, the fresh food, and the strong sense of community they feel by being part of the local food movement. Most of all, they love working together all day, every day. “It never gets old,” says Nate. Nate and Jill are still selling shares for their CSA, which will get rolling on May 26th after the first harvest of the season with arugula, spinach, mint, scallions, radishes, lettuce and perhaps some eggs. Get in touch with them for more information, and quickly– there are only ten shares left for purchase! This entry was posted in On the Farm and tagged CSA, Four Season Farmer Development Program, green things farm, jill sweetman, lindsay partridge, nate lada, Real Time Farms, tilian farm development center. Bookmark the permalink. It’s really inspirational to see young people set their roots into the earth, and grow their leaves to the high reaches of the sky. What I find particularly interesting is how educated the new generation of farmers will be. We’re coming out with an understanding that can see deeply into so many facets of the work we are doing, and how our farms, mainly by the consciousness of the farmer, have so much an impact in healing the earth. I find it particularly courageous to see that these two made up their minds and went for their goal, and I see it blooming into abundant success, able to help and feed hundreds or thousands. Thank you for your dedication and work.